The Downtown Investment Authority's budget for the upcoming fiscal year does not include any money beyond $200,000 for the salary and benefits for incoming CEO Aundra Wallace. Investment in Jacksonville commercial real estate came in 29 percent higher in 2017 than in 2016 with $2.57 billion in transactions, according to Colliers International of Northeast Florida. The year end investment report broke down the major sectors of commercial real estate by office, industrial, hotels, retail and multifamily. In Northeast Florida, as in most major markets across the country, the lion's share — 61 percent — of investment has landed in multifamily properties, with $1.56 billion of real estate transactions recorded in 2017. There was $315 million of warehouse/industrial properties change hands in Northeast Florida in 2017, representing 12 percent of the total. However, the Colliers report noted that 85 percent of the $315 million came in five portfolio deals involving institutional investors. Retail sales represented 9 percent of commercial real estate transactions, with $239 million of property being sold in 2017. The office sector had $228 million worth of transactions in 2017 with 12 properties trading, representing 1.82 million square feet of office space. Just over half of the $228 figure came in a single transaction as Gramercy Property Trust sold part of Bank of America's corporate campus at 9000 Southside Blvd. for $115 million. There were $231 million worth of hotel transactions in 2017, with the sale of the Hyatt in downtown at $115 million. 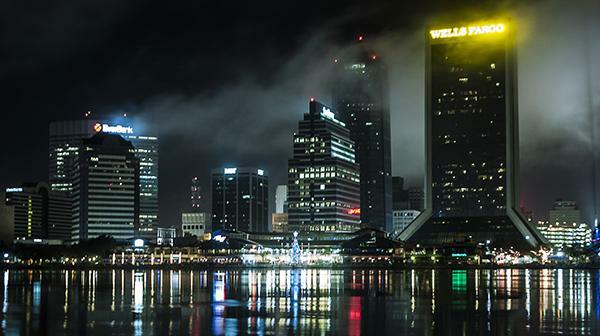 While sales volume was up 29 percent compared to 2016, Jacksonville's record year for transaction volume came in 2014 with $2.9 billion in commercial real estate sales. "In 2018, we expect stronger interest in hard assets as interest rates stay low and tenant demand remains robust, and as Jacksonville continues to have strong job and population growth," said Scott Rogers, Colliers International's vice president of investment sales.